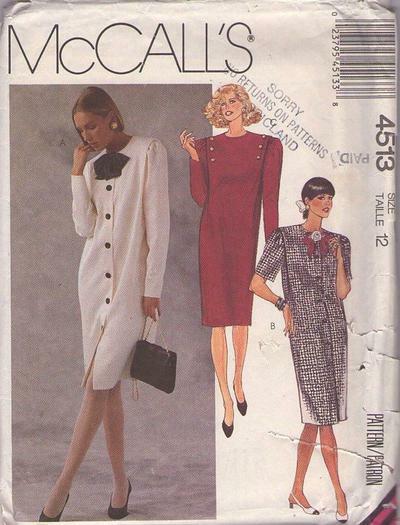 1989, 80s Career, Retro Office Clothing Patterns - MISSES' DRESS: Straight fitting dress A, B or C with pleated shoulder detail has shoulder pads, sleeve heads and sleeves with gathered caps. Dress A with long sleeves or dress B with short sleeves has front buttoned opening and optional purchased flower for dress B. Dress C has buttoned trimmed shoulders, back zipper opening and lower back vent.